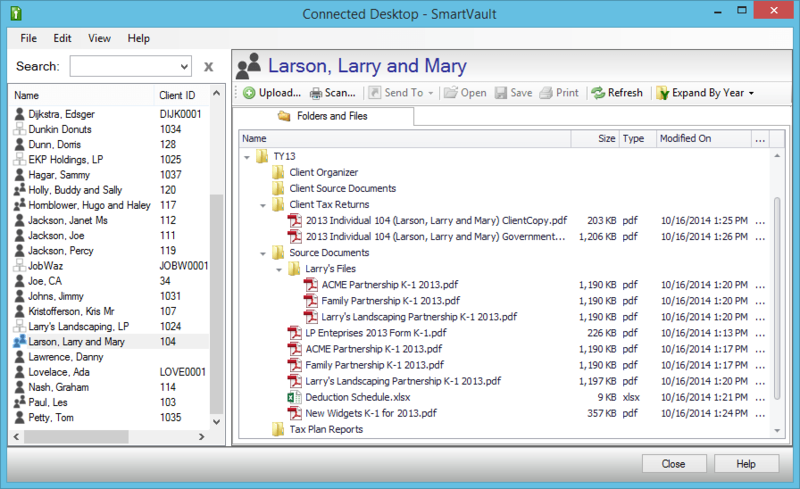 HOUSTON, TX – October 30, 2014 – SmartVault, a leading provider of Software as a Service (SaaS) online document storage and secure file sharing solutions, today announced the release of its new SmartVault Connected Desktop. Connecting users to their data in a simple, easy-to-use interface designed and optimized for the desktop, the SmartVault Connected Desktop delivers massive efficiency gains in the day-to-day document workflow of accounting professionals. Earlier this year, SmartVault teamed up with tax and accounting software giant Intuit® to deliver an integrated document management solution for it’s large base of tax customers, automating tax preparation workflow—from receiving source files from clients to printing and sharing final tax returns with a built-in custom branded client portal. SmartVault is the recommended replacement for Intuit’s current document management system (DMS) and has been working closely with thousands of existing DMS customers as they transition from DMS to SmartVault. The Connected Desktop was conceived directly from customer feedback. Currently, the SmartVault Connected Desktop is available for customers who are on the company’s tax plans—SmartVault for Intuit Lacerte® or Intuit ProSeries®. The Connected Desktop will be available to customers on all accounting plans in early 2015.